The Belvedere Estate consists of Belvedere House and the 30 acre (120,000 m²) grounds surrounding it with a beautiful garden, located in Alipore opposite the zoo. Belvedere House was the former palace for the Viceroy of India and later the Governor of Bengal. the National Library of India is housed, since 1948. The Governor-General resided in Belvedere House, Calcutta until the early nineteenth century, when Government House (present Raj Bhavan) was constructed. In 1854, after the Governor-General moved out, the Lieutenant-Governor of Bengal took up residence in Belvedere House. When the capital moved from Calcutta to Delhi in 1912, the Lieutenant-Governor of Bengal, who had hitherto resided in Belvedere House, was upgraded to a full Governor and transferred to Government House. 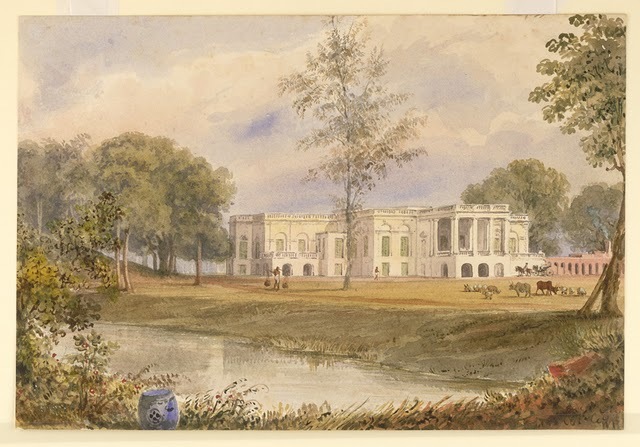 It is believed that while Mir Zafar Ali Khan was in Calcutta, he built many buildings in the area and gifted Belvedere House to Warren Hastings in the late 1760s. It is believed that the roots of Belvedere House lie in the late 1760s from approximately the time when Mir Jafar Ali Khan, the Nawab of the province of Bengal was compelled by the British East India Company to abdicate his throne at Murshidabad to Qasim Khan in 1760. Mir Jafar moved to Calcutta where he is thought to have owned a large court house, and settled within the safety of English East India Company fortifications at Alipore. It is believed that while he was in Calcutta, he built many buildings in the area and gifted Belvedere House to Warren Hastings. After the Battle of Buxar in 1764 Hastings left for England. He returned to Calcutta as Governor in 1772 and to his garden house, the Belvedere with a certain Baroness Inhoff by his side. The grounds of Belvedere Estate were witness to a duel between Warren Hastings and his legal officer, Philip Francis. The duel may have been over the Baroness Inhoff, or was the outcome of political conflict between the two. It is believed that Hastings finally sold Belvedere House to a Major Tolly in the 1780s for the sum of Rs. 60,000. Charles Robert Prinsep (1790–1864), lived at Belvedere Estate for a time. Prinsep served as standing counsel to the East India Company and then as the Judge Advocate General of India during the time when he resided at Belvedere. After this it was turned into the official residence of the Viceroy of India. National Library of India, Kolkata, is housed in the Belvedere Estate since 1948. The main building, however, is presently under the care of the Archaeological Survey of India, as heritage building. The view of the Belvedere Estate has been captured by the Anglo-Indian merchant and amateur painter William Prinsep in 1838. This entry was posted in Establishments, Government Establishments, Libraries/ Archives, Official Residences, Palaces and tagged belvedere, belvedere esate, bevedere house, British East India Company, buildings, charles robert prinsep, East India Company, fort william, old calcutta, Warren Hastings, william prinsep.